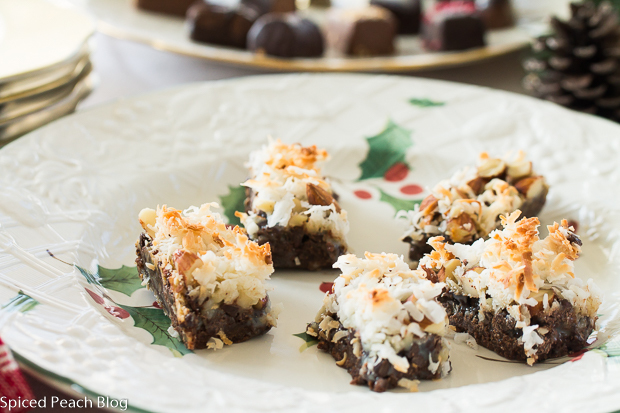 Who makes the Chocolate Coconut and Pecan Bars as part of their holiday sweets collection? 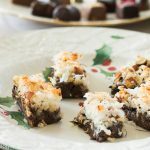 Each year I see these trending about and thought why not, after all what’s not to like in the combination of chocolate, coconut, and pecans? Well, it all depends on your tolerance for the really, really, really sweet. Yikes. Did I mention really sweet? 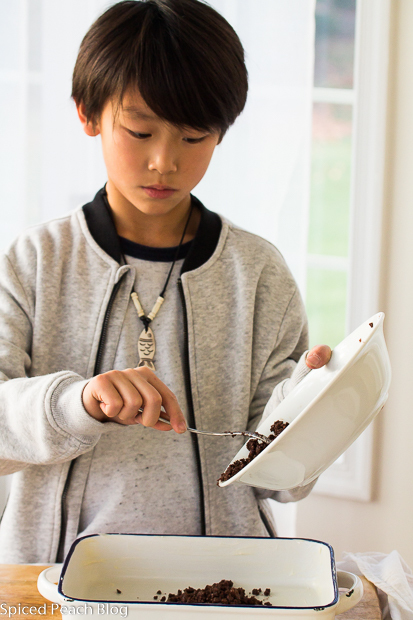 It seemed Chocolate Coconut and Pecan Bars might be a fun, quick and easy after school project for my grandson, the J-Dude, so I set him to the task. I mean really there is nothing in this recipe that requires much supervision for a ten year old who’s been cooking with his grandmother practically since infancy. Same as they say everyone is born with a unique personality, this cookie/candy bar made me ponder on the quotient factor that people are also born with a sweetness tolerance. And the J-Dude has a high one. High sweetness tolerance, that is. 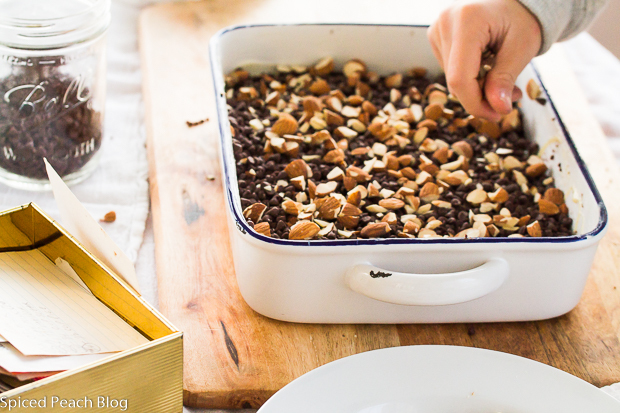 Even so, while preparing Chocolate Coconut and Pecan Bars, he, in his own food experienced way indicated to me that the ingredient amounts seemed to be too much. I agreed, not to mention that Aunt Betty’s recipe card seemed to have less than the standard, confirmed in the curiosity of checking it out. The J-Dudes astute observation turned out not to be so much as a teaching moment as a discussion in applying common sense to a method, in this case, even using the designated graham cracker base then halving the pile up of sweet ingredient components would still give you a very sweet bar. Once baked and cooled we decided that these would be better served in smaller sized bites. And we did so intermittently stacking and lining the inside of a long plastic container readied for Christmas Eve. 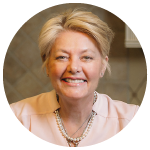 We all need a bit of sweetness in our holiday season, but when it comes to the really, really sweet quotient, for me, better off putting that into just plain practical niceness. I can’t wait to pull out the Christmas Cookie Cutters this weekend readied for preparing a more balanced flavor profile of sweetness for the Christmas Eve tray, some simple old fashioned Christmas Cookies with red and green sprinkles. A very sweet holiday treat. 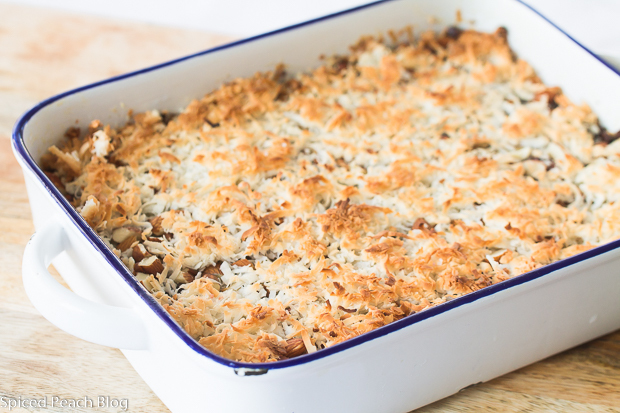 Recipe may be adjusted using the same amount of graham cracker bottom crust then reducing amounts of condensed milk, chocolate, pecans, and coconut. If reducing ingredients be sure to drizzle on enough condensed milk onto the graham cracker mixture as it serves as the "glue" for the toppings. Preheat oven to 350 degrees. 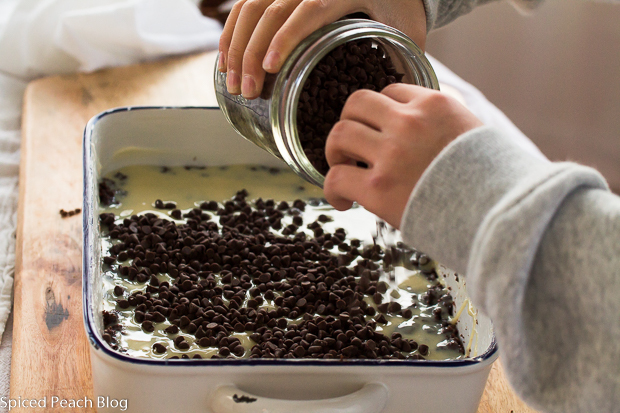 Grease a 9 inch baking dish (approximate size.) Pulse graham crackers in food processor to fine crumbs to make 1 1/2 cups, transfer to a medium sized bowl. Pour melted butter into graham cracker crumbs fold throughout to combine well. Evenly spoon buttered graham mixture into greased dish to cover the entire bottom. 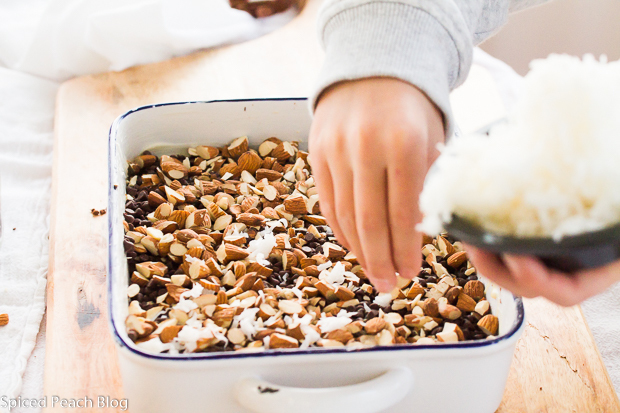 Drizzle over the condensed milk, sprinkle all about the mini chocolate chips, pecans, followed by coconut, pat down the coconut. 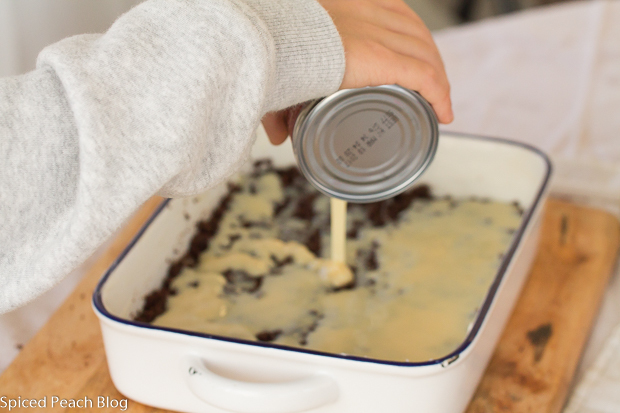 Place dish onto a baking sheet, cover with aluminum foil. 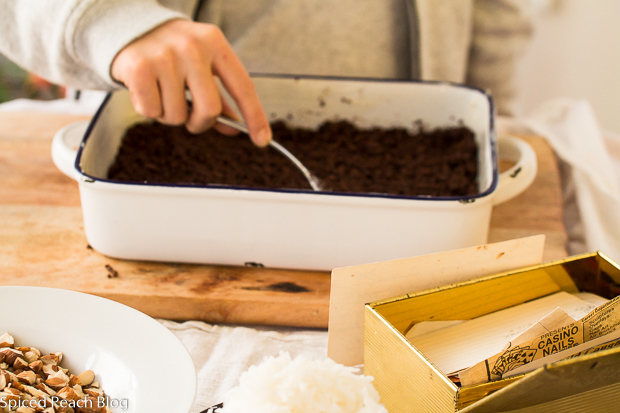 Bake around thirty minutes or longer, until chocolate has fully melted and coconut is golden browned. Cool bars to room temperature before refrigerating overnight, cut into small sized bites. 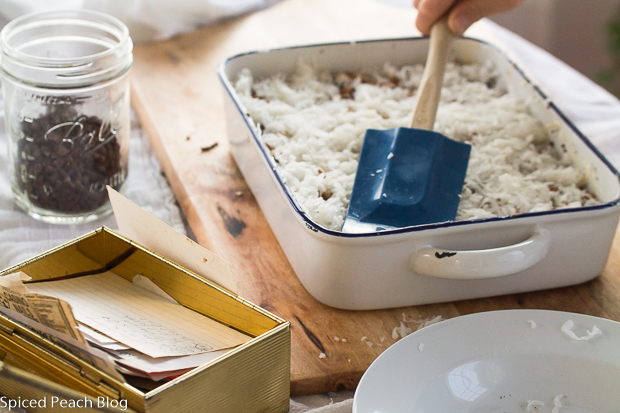 Chocolate Coconut and Pecan Bars may be frozen between plastic wrap and freezer paper. Defrost in the refrigerator. This entry was posted in Holiday Favorites, Sweet Treats and tagged Chocolate Coconut and Pecan Bars. Bookmark the permalink. Post a comment or leave a trackback: Trackback URL. How lucky you are to have a helper in the kitchen, and a very astute one at that. We have a few in our family that really like the sweet sweets . Love chocolate and coconut the flavor can’t be beat. Thanks Cheri, it really is a pleasure to have my grandson cook with me and some fun memories too. 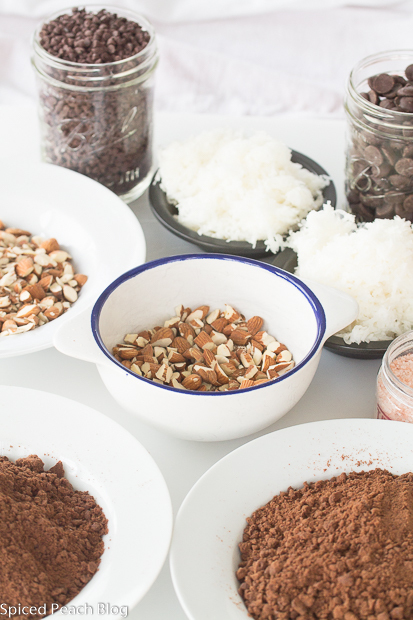 I love chocolate and coconut too, not quite at this overload, but as a combination it sure is a real winner to my taste. As Cheri said, you have a great helper in the kitchen, Peggy. You’re making memories. <3 Love it! Thanks Kelly! Hope you and the Senor are enjoying your holiday season! Hi Meredith, Thanks much. Enjoy! It must be great to do what you love with your beloved ones! The chocolate looks yummy i’m drooling! p/s: your little helper is adorable!